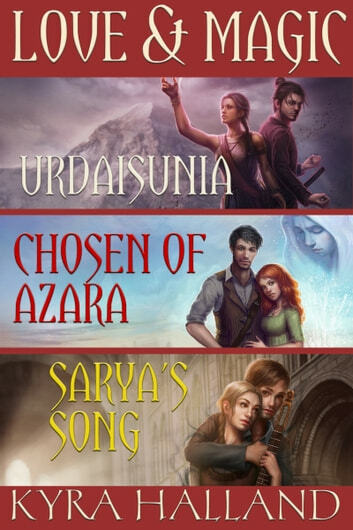 Urdaisunia: In Urdaisunia, a land torn by war and drought and abandoned by the gods, a widowed rebel and a prince walk intertwining paths of danger, love, and war to save the land they both love. 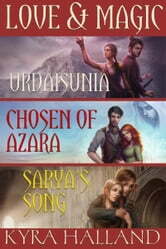 Chosen of Azara: In a quest that spans centuries, Sevry, the last king of the land of Savaru, searches for the woman who holds the secret to bringing his destroyed homeland back to life. Sarya's Song: In a world where music is magic, disgraced musician Sarya dyr-Rusac hears strange and powerful new music on the wind. Torn between the man who loves her, whom she can never have, and a beautiful man in chains who appears in her dreams, begging her to sing him free, she must discover the meaning of the mysterious music she heard before the world itself is torn apart.